On the one hand, I can’t help but smile ear-to-ear. I love this sun-filled apartment (except that I don’t have blinds yet and I’m being woken by blinding light at 5am). I feel rejuvenated, infused with energy, and pumped with extra gas (not the kind from beans)! I feel like I can take on the world, or at least improve my photography now that I can take pictures with plenty of natural light. Life seems a little too perfect at moments, but then I’m reminded of how I don’t have a kitchen. When I can’t even find a spoon in the mornings to stir my coffee with, I always tell myself, today, we’re going to get all the renovation plans done. But it just isn’t that simple. There so many variables and so many are contingent on other variables. First is setting dates: We have to submit the alteration plans to our condo board, who have to approve our plans and the starting dates. The dates have to be coordinated with our general contractor, our cabinet makers, and the purchasing and delivery of appliances. Then, there is a possible union strike coming this month (if you live in an apartment in NYC, you should’ve been notified by your building), so we decided to push plans back. Next, design: There’s functional and aesthetic needs and both Lon and I have to agree on it. The floor material and colors have to match our cabinets, and both have to match our countertops, and all have to match our appliance surfaces, and all have to fit in our space. If we move the stove here, then we need to move the sink there, then the fridge, etc. It’s all so intertwined. I bought asparagus and then it took me two long days to figure out what to do with them. (Don’t do that because they’re best eaten as soon as possible after being picked.) 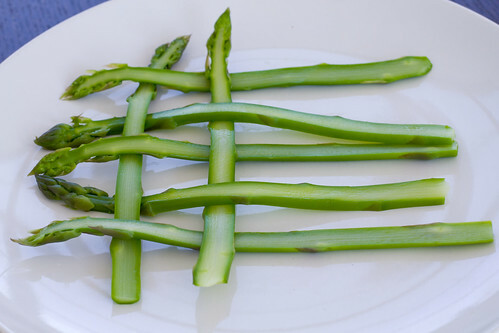 I’m not really sure why I thought to weave the asparagus but it might have to do with everyone sending Lon pictures of bacon mats. I figured they wouldn’t weave well whole, so these are sliced on a mandolin to give you nice flat pieces. I also like the way it looks because of the extra color variance, light green in the middle with darker green borders. 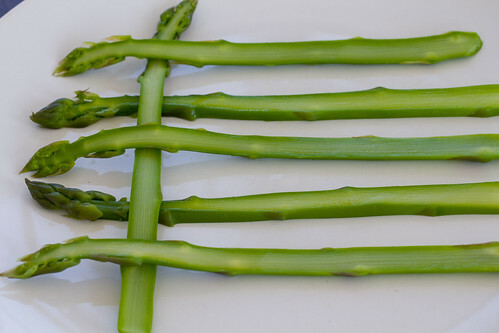 It helps to use thicker and longer asparagus, and try to coordinate the widths and lengths. Luckily, this is no way as hard, and not half as many variables as renovating a kitchen. The weaving actually came together quite easily, needing only to weave 10 pieces together for a gorgeous plate. I should mention that this is delicious too. 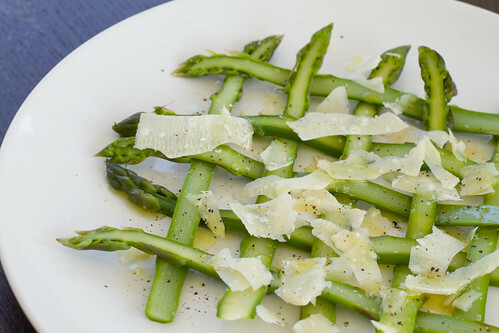 It’s simple and elegant, showing off the abundant fresh asparagus now. A touch of lemon, a drizzle of olive oil, some Parmesan shavings, and a sprinkling of salt and pepper is all you need to show off your seasonal spears. 1. Break bottom ends of asparagus off at their natural breaking point. Blanch in salted water for about 1 minute. They should be bright green and al dente (you can cook extra and just taste one). 2. Drain and rinse with cold water. Drain. 3. Slice with a mandolin to 1/4″ long slices (as pictured). The stem end goes through first. Each stalk with give you about 3 slices, but often the third will not be usable. (I just ate those pieces while I was working). You need 10 good pieces. 4. To weave them, start with one piece laid straight up. Place 5 pieces in a row, perpendicular to the first piece, alternating above and below the first straight-up piece. 5. The next piece will be parallel to the first piece, weaving above and below the 5 sideways pieces. When you weave it above and below, do the opposite of the first piece. See picture. 6. When you finish, the 10 pieces will look like this. 7. Squeeze some lemon on top. Drizzle with olive oil. Shave parmesan on top. Sprinkle with salt and pepper. Serve. posted by jessica	at 08:35 AM	Filed under Italian, Recipes. You can follow any responses to this entry through the RSS 2.0 feed. Both comments and pings are currently closed. Beautifully presented! The weave is perfect for Spring- just like a basket! 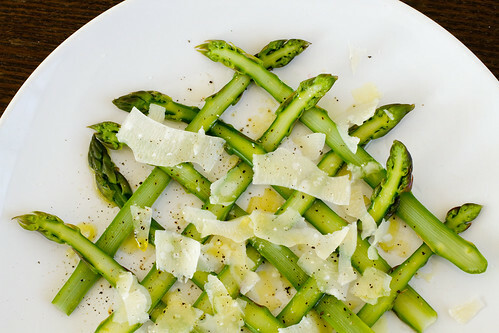 The simple ingredients can really let the asparagus shine. That is clever and appetizing. This presentation is gorgeous! Very, very creative! Great idea! This dish is so eye-catching, yet so simple. I can just taste the fresh flavors now. 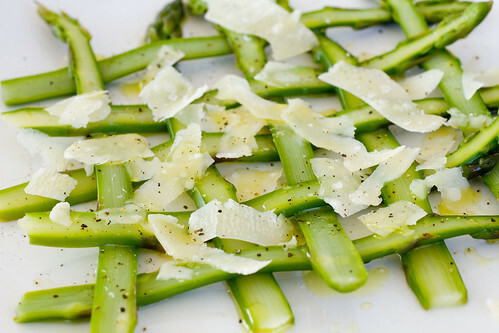 A georgous spring salad: a tasty & classic combo Parmesan & green asparagus!! What a beautiful salad! 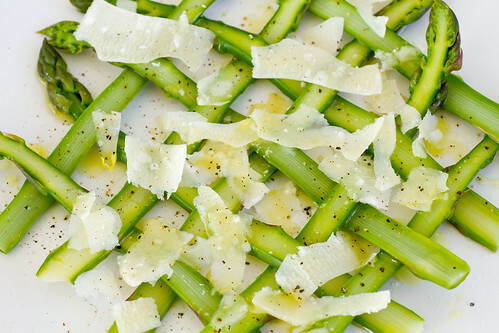 I love the combination of Parmesan and asparagus and what a fantastic way to present it. Elegance and simplicity all wrapped up on one plate! 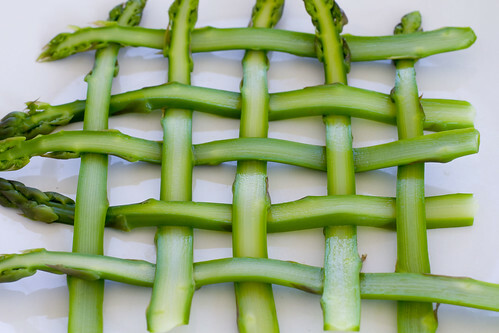 This is so lovely and we adore asparagus so much. It’s just so boring…although I have started roasting it for more flavor. Now your dish is a company dish. And a super ladies luncheon idea! my wife asked me if I knew how to braid hair and I resoundedly answer “no”. so this dish is WAY too hard! 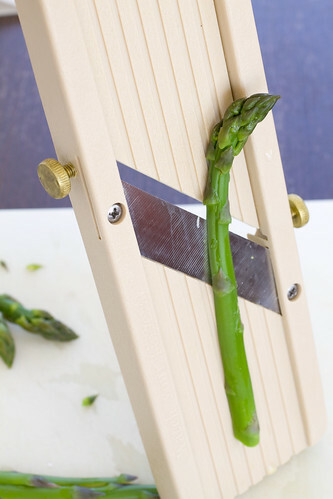 Not to mention the mandolin + asparagus stalk will mean instant proof of idiocy on my part… looks awesome tho. Barbara, I’ll be expecting pictures! SinoSoul, it’s really not as hard as it looks and having tried braiding my hair, this asparagus salad is way easier than that. Asparagus! One of my faves. The salad looks fun and very creative. Here’s one for ya. Blanch asparagus, refresh in ice water, chop garlic, ginger and asparagus. Place in mortar & pestal w/ salt, pepper, curry powder and fish sauce or soy sauce. Grind to a paste. It’s great w/ noodles or grilled fish. BTW, FM was mentioned in Food News journal today. Ciao! Jai, wow, I’ve never turned asparagus into a paste! It sounds like a great summer sauce. I saw the Food News Journal, thanks! I am going to try this… perhaps with a poached egg perched on top. Thanks for such a simple but beautiful recipe. I see a little something truly special in such a website. This is a fantastic web page, might you would like doing an interview around just how you designed it? If so e-mail everyone! ?? Is there no cooking involved? 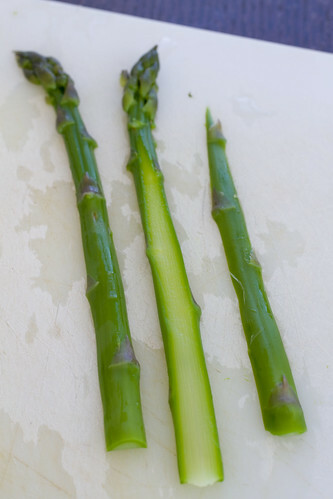 I am confused–are we eating the asparagus after blanching without any cooking? Thanks-so, so pretty! Or is blanching considered “cooking”…….? Phyllis, blanching is cooking. Just basically cook the asparagus lightly, and not until soft and mushy.